Last night we had a fabulous meal at a restaurant called The Kissing Pigs on the quayside in Bonifacio. As you would expect from the name, they specialise in pork dishes but Jo had lamb cooked in onions and figs and can only be described as sublime. Liz had a pork dish cooked in Muscat and chestnuts – also delicious. This morning we made the most of the “free” wifi we found so that all our emails and apps were up to date. We then went food shopping, making the most of the French supermarkets as the Sardinian ones aren’t great and we have been spoilt with Spanish ones. We have more friends visiting in a couple of weeks so we made the most of the fact that the supermarket was on the quayside to stock up with booze! 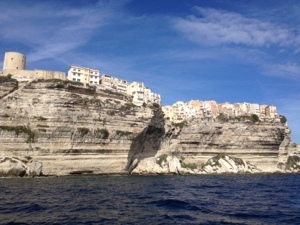 We left around 1400 to go about 10 miles around the bottom corner of Corsica to a small bay on the SE tip as we have westerly winds for a few days so we should be sheltered on this side from the wind and the swell. We are now anchored in turquoise, clear water close to the beach with only a catamaran for company. There is something special about being anchored or on a mooring buoy, turning with the wind and gently bobbing with the waves. 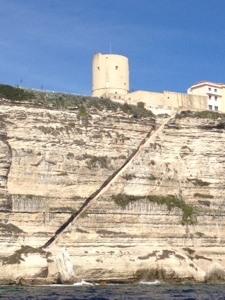 Pictures below of Bonifacio as we left and King Aragon’s Steps from the sea.